The 2019 PMP Survey Challenge! For every form you submit by April 30 you will receive 1 “virtual ticket” for a prize. The more forms you submit, the better your chances to be randomly selected for a great prize! You can submit one form per topic: Mosquito, Ant, Cockroach, Bed Bug and Merger. Maximum 5 entries per person. Each survey is only 20 questions and should take no longer than a few minutes to complete! Ten (10) participants who complete forms by April 30 will be randomly selected to receive a PMP “Pests Playing Poker” poster. Five (5) participants who complete forms by April 30 will be randomly selected to receive one (1) $200 gift card. One (1) participant who complete forms by April 30 will be randomly selected to receive one (1) $500 gift card. Results from these surveys will be published in PMP throughout the year, so be sure to see how your answers compared to your peers’ across the country! Sweepstakes begins Wednesday, January 23, 2019. Sweepstakes ends March 15, 2019 April 30, 2019 (extended deadline). (the “Entry Period”). 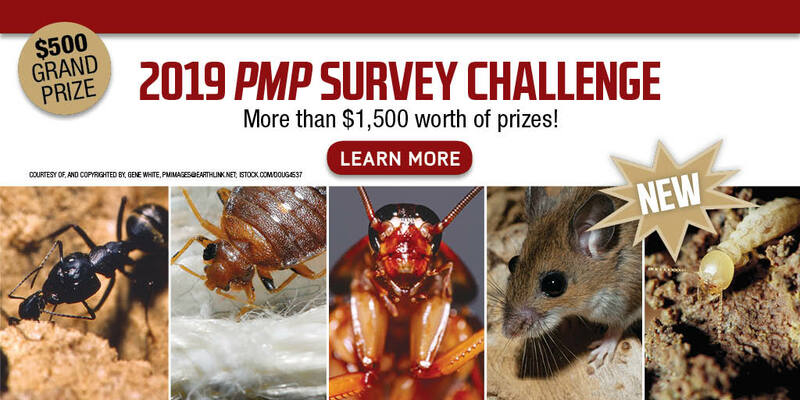 How to enter: To participate in the 2019 PMP Survey Challenge, entrants must submit an online form located above during the Entry Period. One entry per person, per survey form/topic. Maximum 5 entries per person. Contact information is the only mandatory information needed to enter. Completing the surveys does not increase your chances of winning. You may only submit each survey form once. Ten (10) participants who complete five (5) forms during the Entry Period will be randomly selected to receive a PMP “Pests Playing Poker” poster. Five (5) participants who complete five (5) forms during the Entry Period will be randomly selected to receive one (1) $200 gift card. One (1) participant who completes five (5) forms during the Entry Period will be randomly selected to receive one (1) $500 gift card. Selection of Winners: On March 15, 2019 April 30, 2019 (extended deadline) North Coast Media will select the names of twenty-five (25) PMP “Pests Playing Poker” prize winners, five (5) $200 gift card prize winners and one (1) $500 gift card prize winner in a random drawing of all eligible entries via the PMP Survey Challenge forms received during the Entry Period. The odds of being selected as a potential winner depend on the number of eligible entries received during the Entry Period. The potential winners will be contacted via email and asked to provide their full name, age, and mailing address for eligibility within a specified time period. If the potential winner does not respond within the timeframe stated in the notification email, North Coast Media may select an alternate potential winner in his/her place at random from all entries received during the Entry Period.